Give a man a fish and he eats for one day, but TEACH him to how to bone, saute and dress up that fish, well, that’s another story. The school year has come to a close for our under-21s but we know that you hunger (pun totally intended) to learn something new...in the kitchen. Cooking classes abound in our area; some will teach you how to make the perfect french macaron (not to be confused with the American macaroon with two “o’s”), cooling summer soups or regional delights that transport you without standing in pesky security lines. Don your best apron, raise a spatula and proclaim this the summer that you learn some rockin’ cooking skills and new recipes! Summer school has never looked so good. At the aforementioned chocolatier Fritz Knipschildt’s cafe, Chocopologie, you can indulge your sweeter side by learning the fine art of truffle-making right alongside Fritz himself. Discover how to create classic, dark chocolate truffles (rolled in a variety of “toppings”), have a lovely dinner and wine and call it an fabulously decadent evening. Recipes that you leave with will help your sugar-cravings for a good long time afterwards. Classes are one and half hours long and cost $59 per person. Head over to Chocopologie’s Facebook page for time and date details. Do you love butter as much as Julia Child? Does it make you sigh? Then you surely must love croissants. The bakers at Wave Hill Breads in Norwalk can show you how to make these flakey, buttery delights....classic, almond or au chocolat...swoon over your handiwork. Wave Hill Breads creates a wide range of specialty breads...from their gorgeous Epis which look like a wheat sheaf, to light and airy brioche and their new three-grain olive and roasted red pepper ciabattas, plus many more. It’s said that man cannot live by bread alone...but maybe if it’s a croissant...www.wavehillbreads.com. Contact “The Brazilian Foodie”, as her blog names her, and Chef Leticia will design a cooking class based on your needs and wants. Interested in marking your husband’s birthday with friends in a special way or simply want to learn how to handle your kitchen knives like a pro? Chef Leticia, who was born and raised in Rio de Janeiro-a long way from Weston- will assist or demonstrate for you. Brazilian fish stew, Molten Dulce de Leche Cake and Cod fritters are some of the headliners in her international kitchen. Head to www.chefleticia.com for contact info and start planning a great class with Leticia! Prices start at $125 per person and classes last from 1.5 to 3.5 hours. From Cranberry Pecan Sourdough to Coconut Creme Tarts to Red Velvet cakes, the SoNo Baking Company makes it all. And lucky for you, classes are offered to teach you how to make some of their wonderful baked goods. Go behind the scenes at the baking company and before long, you will be brimming with new skills sure to impress. Baking is tricky, so it’s best to learn with the pros. You don’t want things to get ugly with your tarts. Check www.ctbites.com for class listings. Bet you didn’t know that a little sliver of Italy resides in Wilton? Sally Maraventano of Cucina Casalinga and her state-of-the-art kitchen and outdoor stone pizza oven will highlight foods of this magnificent country and her heritage. Daytime and evening classes for adults (corporate and private, too) are held on a regular basis and will have you exclaiming “Brava!” in no time flat. Classes for 11-16 year olds are also offered, so it’s never to early to learn your way around the kitchen. Each class with Sally makes an entire menu...summer garden vegetable recipes, grilled specialties, homemade pizza dough, gelato. Enjoy your creations among her fig and lemon trees out on the patio. www.cucinacasalinga.com. Whether in your home or at their new, state-of-the-art kitchen facility, ”The Art of Good Food” will come to life for you at AMG Catering and Events. Classes are 2-3 hours, each focusing on 3-5 dishes, which are themed to such subjects as special holiday dinners, proteins, dietary restrictions or regions. A great variety to enjoy with friends or coworkers! 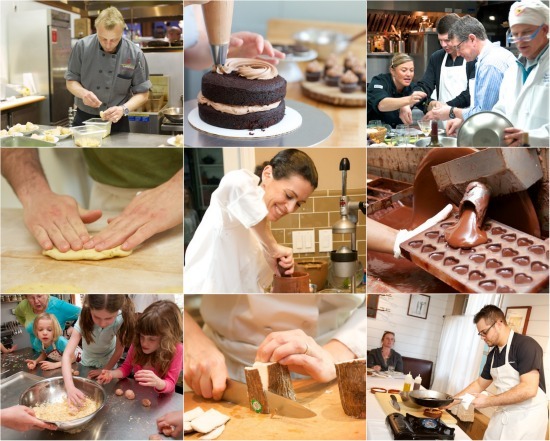 With adult classes and also “CIT” (chefs-in-training) class for kids in summer (4-day sessions, $425), there is something for every cook all year long. Note: During the summer, only private adult group cooking classes are held. Regular classes will resume in the Fall.